There are lots of ways to be involved, from helping out at events to joining a working group. 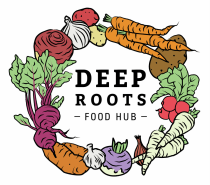 Please speak with any one of us at workshops, local food events, or by emailing us at info@deeprootsfoodhub.ca. DRFH is led by an engaged group of local residents, farmers, business owners and healthcare providers. Our volunteer board is seeking new members for a two-year term. If you live or work in West Carleton and care about healthy and local food and want to work with us to make these foods more easily and affordably available to others in West Carleton while also supporting our local farmers, please consider this opportunity. The commitment is for one board meeting a month in Carp plus joining one sub-committee or helping on specific activities for a total of 5-10 hours/month. If you are interested, please email board@deeprootsfoodhub.ca. DRFH is also eagerly seeking new volunteers for several exciting new projects. If you have some time and skills to share and are concerned about our local economy, food access, health or the environment please consider helping out. We need many hands to join sub-committees including education, communication, finance and distribution as well as to help out on specific projects. If you would like more information, please contact kate@deeprootsfoodhub.ca.